This week, I have been waking up feeling full of life and buzzing with energy. I feel like I am dancing and singing around the place, now whether I am or if it is in my head I dunno, but it feels good to be alive and free and full of optimism again. The sun has been shining, the wind mild and the cool frosty mornings feel magical. My overly happy mood may be a result of my son sleeping through the night in his own bed for the first time in a very long time. The phases of not wanting to be separated from mummy are quite hard to deal with on a massive lack of sleep. Who doesn’t love a nice lazy weekend brunch with a good plate of food, a nice hot coffee and a catch up of the weekend papers or social media? I know a lot of people would prefer to go out and have a menu to choose from and someone else to do the cooking and clean up but I just don’t have the finances for that and also in all honesty, I tend to keep my day without my son just to myself, no noise, no chatter and no interruptions. Yesterday I woke up and went down to the kitchen and just started cooking. I made cookies and muffins and then some breakfast for myself. It was bliss. 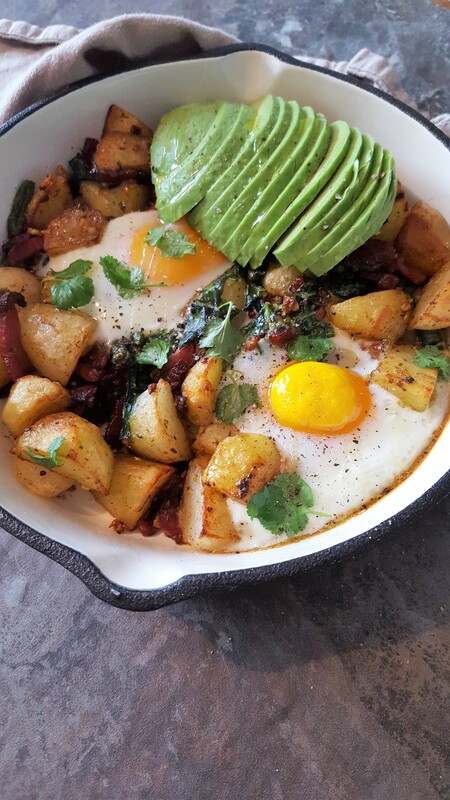 So for my sunday morning treat, I made a breakfast skillet. I don’t make them often but when I do I always wish I did it every weekend and can never remember why I don’t. I love these as you can use up loads of left over foods from the fridge and there a million and one combinations. They are kind of hard to mess up (although I have done it when I was very very tired). Perfect for breakfast in bed or brunch with friends. But I made this one just for me (and scoffed the lot in about 5 minutes flat). This is a super flexible dish, The two handfuls of times I have made this, I have raided the fridge and made it different every time. 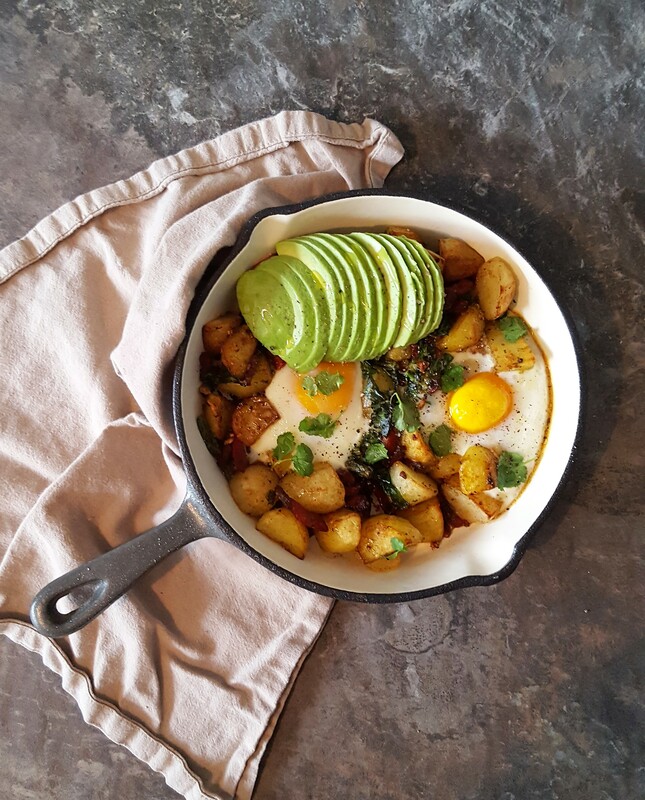 In general, potatoes and eggs are always a must for this dish (for me anyway) as it sets you up for the day, but everything is subject to what you are in the mood for and what you might have in the fridge. 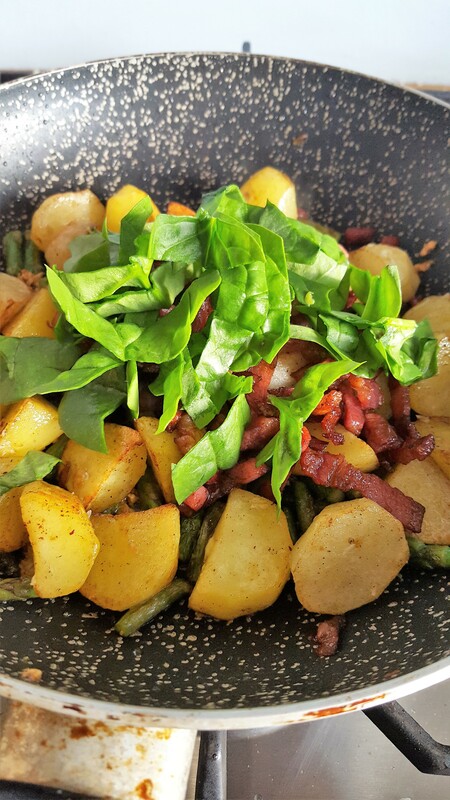 I used a handful of baby asparagus and spinach in this dish as they were looking a little on the sad side and I didn’t want to throw them out. Doesn’t take too much time and tastes great! Tip: make sure your pan has a non melting handle to be safely placed in the oven. The smell of melting plastic takes days to get out of your house, trust me I have done it several times. Peel, and dice your potatoes. Now don’t shoot me for saying this, but I like to cheat and speed things up a little by microwaving my potatoes to semi cook them before frying. I stick them in a bowl, cover with cling film and pop them on at 850W for 5 minutes, stirring half way through. It means less frying time. Meanwhile put the oil in a hot oven proof frying pan or skillet and add the pancetta and cook on medium heat for the 5 minutes until nice and crisp (not burnt though). Once crisped, scoop from the pan leaving behind as much of the oil and fat as possible as we use this to fry the potatoes in. When the potatoes are done microwaving, tip them into the newly vacated frying pan and cook on medium for another 7 minutes, stirring every so often to turn the potatoes. In the last-minute add the garlic and stir well. 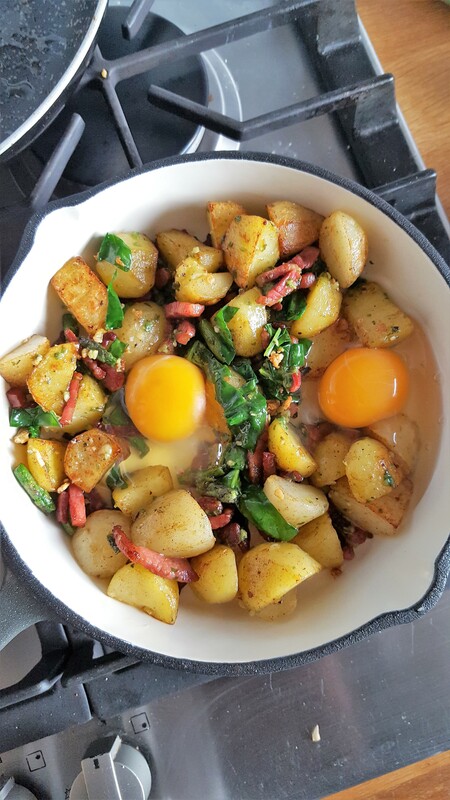 Toss in the asparagus, spinach and pancetta and mix. Make 2 wells/indents for the eggs. Crack the eggs one by one into a small cup and gently pour into the indents. Place in the oven for 5-8 minutes until the egg white is just cooked. Remove from the oven, sprinkle with salt and pepper and a drizzle of oil and top with the avocado.